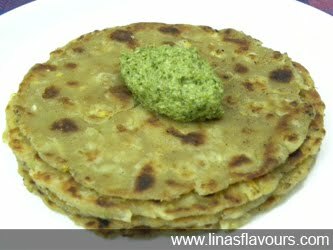 Corn Paratha or Makai ke parathe is a mixture of grated Corns and wheat flour which gives softness and sweetness to taste. Garlic, ginger and green chilli adds little hot and pungent taste in mouth. In whole the combination of taste is spicy sweetness. It can be served with variety of dips like green or garlic chutney in breakfast or as Main course. Boil corn cobs, let it cool slightly and grate it. Take a bowl. Add wheat flour, grated corn, salt, ginger-garlic paste, green chillies, oil and knead soft dough. Make small balls. Take a ball, roll into flour and roll the paratha of 3-4 inch diameter. Take non-stick tawa/griddle and cook it on both the sides smearing with oil. Prepare all the parathas in same way. Serve it hot with green chutney or garlic chutney.